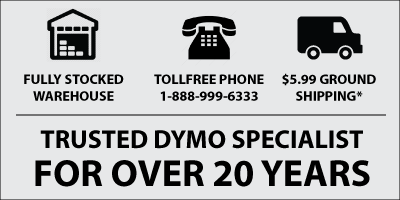 Almost a decade ago, Dymo released it's first Industrial Label Printers - the Rhino range. These label printers enabled users to create all types of labels for many uses, with a big emphasis on cable and wire labelling. Dymo have offered heat-shrink tubes since the inception of the Rhino range, and these have been available in a range of sizes, enabling users to label cables and wires of varying gauge / thickness. The Rhino range of heat-shrink tubes are continuous rolls of tubes, and the user prints the desired text and cuts the label to size using the printers in-built cutter mechanism. This is a neat solution, there's no question about it, but it is a little cumbersome because once you've printed a tube, you typically need to apply it to the wire / cable as the labels are small and can easily be dropped or misplaced. The Dymo XTL range of label printers is phasing out the Rhino range. The XTL series adds a whole bunch of features to industrial label printing, including a wider range of available label sizes and styles. One such 'new' label is the XTL Pre-Sized Heat-Shrink Tubes. Instead of being a continuous roll of tube, these tubes are pre-cut to certain sizes (there's 8 available currently), and when you've printed each label, they stay stuck to the roll of tape and can be removed when you're ready to apply them to the cable / wire (as can be seen in the image on this page). The beauty of these heat-shrink tubes is that the user can print a batch and not have to fumble around trying not lose/drop loose tubes until they are ready to apply them to their wires or cables. Additionally, every tube / label will be exactly the same size, adding an extra little touch of uniformity and professionalism.